Take it down or we will burn it down! That was the ultimatum that Vice President of the New Democratic Party (NDP) Senator St Claire Leacock gave to Prime Minister Ralph Gonsalves at a political meeting Wednesday night. He said that the planning department had confirmed that the ULP sign at Sion Hill was illegal. He said if the sign is not removed, it will be burnt down. Leacock was addressing the sizable crowd that gathered at Sion Hill junction. 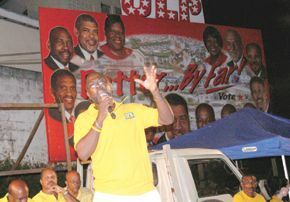 Party president Arhnim Eustace called for government to clarify whether electricity and water bills will be subject to VAT, while reiterating that the country is “in a mess.” Party chairman, Linton Lewis called on the prime minister to lay aside his pride and consider giving the mini bus operators their demanded fare increase because they deserve it.